We're proud to now have FinalFinish and TMS available as high-quality, custom-loaded rounds that will greatly simplify applying a FinalFinish or TMS treatment to a firearm. FinalFinish and FinalFinish TMS will correct/improve all three of the above factors. A typical factory barrel will be improved in all three areas, and even hand-lapped barrels need the chamber reamer marks in the throat corrected to perform to their potential. FinalFinish and FinalFinish TMS will remove the most damaging (to the bullet) tool marks, generating a surface finish that goes WITH the bullet instead of against it, and work out ôtight spots" that disrupt the bullet. It is okay to use FinalFinish in chrome-lined AR15 barrels. 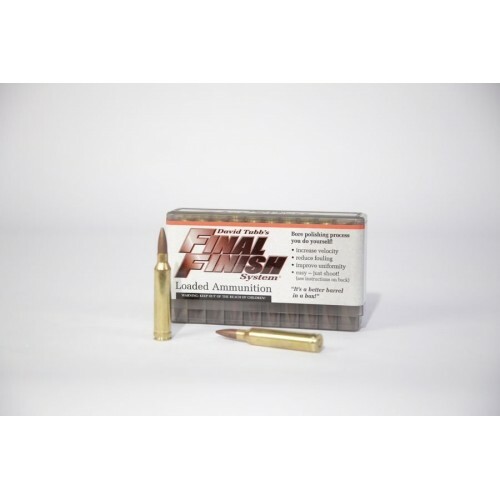 Our FinalFinish Loaded Ammo System provides about 80 percent of the effectiveness of our 50-bullet kit, but does so utilizing only 20 specially loaded cartridges. After thorough testing we determined the combination of Aluminum Oxide grits that results in the most efficient and effective bore conditioning treatment possible -- in the shortest time possible. Complete instructions are included. By following these simple instructions, you will soon be experiencing better accuracy, greatly reduced fouling, and much easier barrel clean up. You'll have the satisfaction and confidence of knowing that you have significantly improved the barrel on your firearm, undoubtedly one of the most critical parts to good performance. And, unlike lubricants and coatings, FinalFinish will reward your efforts for the life of your firearm.